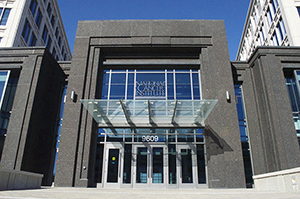 The National Cancer Institute in Bethesda, Md. The AACR strongly aligns with all 69 National Cancer Institute (NCI)-designated centers, which jointly issued a call to action last week urging parents and providers to more diligently ensure all girls and boys under 13 years of age complete the three-dose human papillomavirus (HPV) vaccine series. The AACR enthusiastically supports and commends the cancer centers’ efforts and remains deeply concerned that not enough people are taking advantage of this lifesaving preventive medicine. This call to action reiterates the AACR’s long-standing commitment to promote the use of HPV vaccines to prevent cancer through dissemination of knowledge. maximize access to HPV vaccination services. At the 2014 AACR Annual Meeting, the “AACR Science Policy Track” included the following session: “The President’s Cancer Panel Report ‘Accelerating HPV Vaccine Uptake: Urgency for Action to Prevent Cancer’ – Scientific Advances to Help Achieve Policy Goals.” A member of the President’s Cancer Panel participated in this important session, as well as Acting Director of the National Cancer Institute (NCI) Doug Lowy, MD. AACR journals have increased the knowledge base about why uptake is low by publishing studies, as recently as January 2015, looking at disparities in HPV vaccine initiation and the lack of education among healthcare providers on how to communicate with parents to encourage HPV vaccination. A special report published this month by world-renowned leaders in the field in the AACR’s journal, Cancer Prevention Research, highlights efforts and challenges in increasing the usage of HPV vaccines to prevent the essential cause of a major global cancer burden. HPV vaccination uptake was a lengthy topic of conversation at a recent public education event held by the AACR and the Philadelphia Media Network which featured directors of six Pennsylvania cancer centers. The 2015 Cancer Progress Report highlighted the issue and called on the development of strategies to increase uptake of the three FDA-approved HPV vaccines. The AACR has held numerous scientific meetings focused on prevention that have highlighted the underutilization of HPV vaccines and efforts to promote vaccination. The issue will be discussed at a prevention summit in Leesburg, Va., this week, and is also expected to be covered at the 2016 AACR Annual Meeting. Cancer Today, the quarterly magazine for cancer patients, survivors, and caregivers published by the AACR, has included coverage of HPV vaccines in numerous issues. The AACR administers the Stand Up To Cancer (SU2C)-Farrah Fawcett Foundation Human Papillomavirus (HPV) Translational Research Team Grant. The grant funds a multidisciplinary research team that is focusing on patients with HPV-driven cancers who relapse following initial therapy. The AACR remains committed to moving the issue forward through the resources at its disposal and the expertise of its membership, as well as working with cancer centers, government agencies, and other partners to ensure barriers to HPV vaccination are understood and removed so that we may dramatically decrease HPV-related cancer incidence in the coming years. What is the Latest in Preventing Cancer?